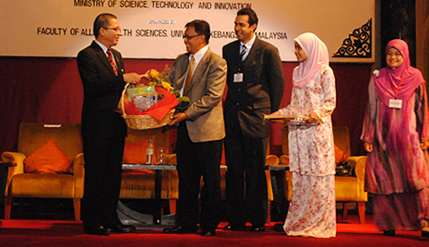 KUALA LUM[PUR, 9 Dec. 2010 – The Government has projected that by the end of the 10th Malaysia Plan period in 2015, 75% of local scientists and researchers will be PhD holders. 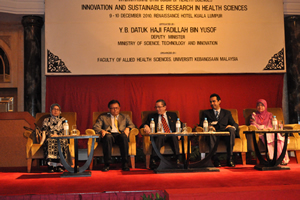 Deputy Minister of Science, Technology and Innovation, Dato’ Hj Fadillah Yusof said that this would not only increase the quality of research and innovations carried out in the country but also increase the number of PhD holders. Opening the 8th International Symposium of Health Sciences at the Rennaisance Hotel here today, he hoped scientists and researchers attending the symposium would highlight their research and innovations for the long term well-being of the people. 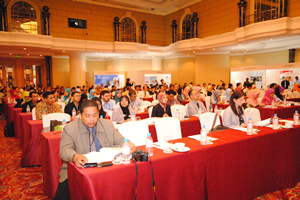 The two-day symposium organised by the Faculty of Allied Health Sciences of UKM will have keynote speakers and paper presenters from Australia, the United States of America, Indonesia, Singapore, Thailand and Malaysia. With the nation in the midst of the process of transformation to a developed nation status, the Government wanted development to encompass all areas, including social and cultural aspects quite apart from the economy and the environment. UKM Vice Chancellor Prof Tan Sri Dato’ Dr Sharifah Hapsah Syed Hasan Shahabudin in her welcoming address, recalled how the university took the bold step to start the Faculty of Allied Health Sciences in the 1980s with only a few key lecturers. Today, the faculty has produced hundreds of graduates to meet the nation’s need for health science professionals, she said in her speech that was read out by Prof Dato’ Dr Lokman Saim, the director of UKM Medical Centre and the Dean of the Faculty of Medicine. She said all health science officers, who are also key opinion leaders, should strive to overcome the many health issues facing the nation like obesity, the welfare of disabled children, diabetes and hyper-tension.